Cheerleader Linda for superior "Cheers and Organization"
Madame Samm for "Sharing Your Vision"
I embroidered Jeremiah 29:11 (NIV) on 2 Quilts. with Uterine Cancer. I still have to quilt and bind ASAP. Lutheran Minister in August 2012. The quilt pattern is the traditional "coin" quilt. PLEASE JOIN ME IN *HOPPING* OVER TO ALL THESE CREATIVE LADIES. LET'S GO SEE WHAT *WORDS* HAVE INSPIRED THEM! Wow, lovely quilts with a most precious sentiment! Love using bible verses in your quilting! They are beautiful! Very sweet - wonderful verses stitched so lovingly for a special gift. What a wonderful blessing for you to share your quilts with us. Thank you so much! Beautiful words stitched and gifted by a beautiful soul. Thank you for sharing your wonderful quilts. They will be loved and cherished by those who receive them. I am sure those quilts will be well loved and used for their comfort and wisdom. Lovely idea and precious work! Love it! One of my favorite verses, embroidered so lovingly on your wonderful quilts. Special gifts indeed! Beautiful words and wonderful gifts for your special people, I'm sure they will be truly appreciated. Love verse and quilts made with love! Thanks for sharing. What amazing words of hope. I've hear the Father whispering them to me many times. Seems like I can never hear them enough. Thank you for sharing your talent and the reminder from above! What wonderful quilts you have created! You've definitely created blankets of love! Thanks for sharing! How beautiful your words are. They are sure to make one feel hope and love. What a wonderful idea - I would never have thought to embroider a verse into a quilt like that, and I love it. Wonderful words to share. It`s been a pleasure to visit you. What a precious gift for both of them. I love this verse; it is so comforting in times of darkness. Thank you for this post. I will add your niece to my prayers. What a lovely idea. I am certain the quilt and the words will bring comfort. Beautiful quilt...I am sure the recipient loves it! Inspirational words are always so impactful. I love that you incorporated them into those quilts. What lovely quilts. I love the way you incorporated your signature as well as the Scripture passage. Prayers going up for Kim. Wonderful gift, and words. Hope she will be well again. What great words. I never think to embroider entire verses on quilts. This I must do. Wrapped in 'double' LOVE. LOVE from the Word and LOVE from You. AWESOME! Beautiful, inspiring scripture that will be cherished by your recipients. Lovely job! Great verse and beautiful gifts! Very thoughtful! These are wonderful and the words are so powerful! Thank you for sharing with us. Awesome gifts you made.Sure they would be very happy with them!! So love your quilts... and such a powerful verse from the Bible. Beautiful works of love. Your color choices are so pretty. I'm sure your niece will find strength in her quilt. What a perfect gift for your niece! The quilt and the verse are both so comforting! I really like yoru quilts the fabrics are very calming colors. And to put the verse into it is just an amazeing idea. What a wonderful, comforting gift. That quilt is truly a giant hug from you to Kim. She will feel the love each time she cuddles with it. Oh I KNEW your quilts would be great. Love the one for the new minister. Wonderful job, as always. (and give that cutie grandson a hug). What wonderful quilts these are- you can feel the love that went into their making! 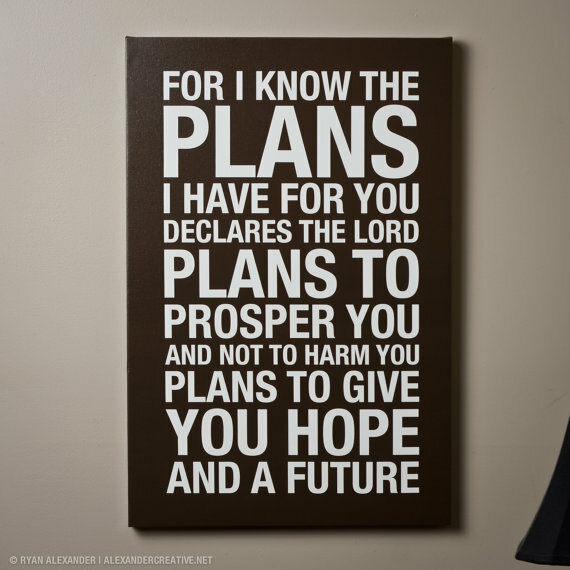 Jeremiah 29:11 is my favorite scripture. I love your self portrait, tooooo cute ! Quilts are such wonderful treasures are they stand, but put your special words and siggy's on them, and that is a gift that will forever hold you dear in someones heart! Prayers for your niece. I'm sure she will love this. Prayers for your family, especially your niece. Your work is beautiful and has given me several ideas. Love the reminders of Jeremiah 29:11, I think I'll make that my verse for the year. Quilted blessings. What a perfect gift for your husband's friend. It's really lovely. Loved your words. Your work is beautiful! Wonderful words with so much meaning , thanks for sharing your talents with us today . Oh! another Great Idea, from another Great Blogger from "In The Words". Love your creative quilt. A beautiful quilt and hope it brings comfort to your niece. My grand daughters favorite verse. The quilts are beautiful. Such a lovely quilt and project - great stitching. 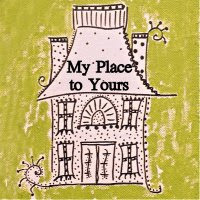 I love the words you chose and how your incorporated them into the quilts! He is in control and His will shall be done!! Blessings!!! Your work is gorgeous and just all the right words!!! Love the words you've chosen. How true this is! They are often quoted in our church as well. 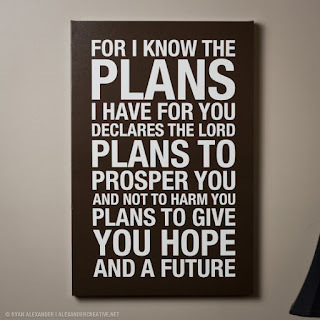 He knows all the plans, and our way is not necessarily his way! Thanks for sharing.! Oh what a inspirational quilt and words. 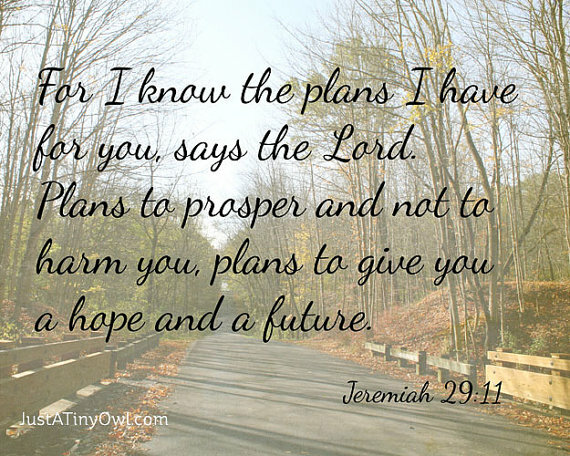 Jeremiah 29:11 is one of my all-time favorite verses, one that has seen me through many different periods of my life. I love the way you incorporated the verse into your quilts......I love the idea of embroidering it on the outer edge. Words to inspire...your projects certainly are a fulfillment. some very special quilts with words to comfort. I love the fabric in you niece's quilt, so pretty! I'm sure both quilts will be loved and cherished. Such special quilts, the quotes are fabulous. You did such a beautiful job. Oh Jane, How beautiful and special. Such very special quilts. Great job. Gosh, this must have been very comforting. Very nice! Very thoughtful and this is a comforting quilt and we all depend on God and his timing. Very nice! Thanks for sharing. This is one of my favorite scripture verses. Love the quilt! And that is my favorite scripture! Your quilts are lovely in all aspects and i am certain that they will be loved! Thanks for sharing. This is one of my favorite scriptures. Very uplifting. Blessing to your niece. I am a breast cancer survivor! I made a queen size quilt for my sister-in-law when she was ordained as a Methodist pastor three years ago. My brother says she gets many, many compliments and comments on it when guests come to the parsonage. Your quilts are sure to bring comfort and a feeling of being loved. Thank you for sharing such personal and heart felt words. Two beautiful quilts! What a great verse to have included. The comfort quilt will be like a big hug when your niece is all wrapped up in it. Super job and thank you for sharing both with us. What a wonderful quilt, it will bring comfort. Thanks for sharing. Lovely. When I read your story, I thought what a perfect verse to give hope to your niece. Then as I continued, it's also perfect for the new minister. Inspiring to know how well it fits many situations. Beautiful quilts! I'm sure the recipients appreciated your sentiments and the work you put into the quilts. OMG so wonderful. I just love your quilts, they truly have great meanings. What a thoughtful quilt/gift! 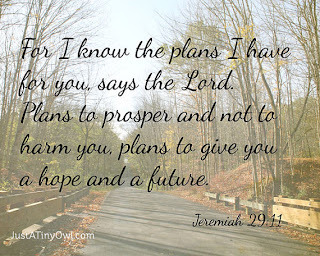 Jeremiah 29:11 is one of my very favorite verses. Such hope, and comfort. I hope Kim is doing well. My second favorite verse, really! I used to have it as my Facebook banner. What a wonderful quilts! 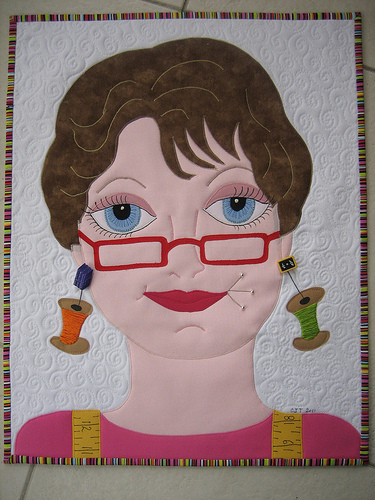 Is that your self-quilt portrait? I love it! !